For many reasons, quitting smoking is one of the best decision you can do for your health. Smoking causes cancer, breathing problems, asthma, heart attacks, stroke and much more diseases. It's a challenge to quit smoking, because nicotine acts on some of the same brain pathways as cocaine. But when you decide to stop smoking, your body starts quickly to recover from the effects of nicotine and additives. In this naturopathic adviser I will give you recommendations how to stop smoking with Homeopathy, Schuessler salts (also named cell salts, tissue salts) and herbal tinctures. I will present you the most proven homeopathic remedies and Schuessler salts, including the appropriate potency and dosage. I wish you much success, joy of life and especially your health. For many reasons, quitting smoking is one of the best decision you can do for your health. Smoking causes cancer, breathing problems, asthma, heart attacks, stroke and much more diseases. It's a challenge to quit smoking, because nicotine acts on some of the same brain pathways as cocaine. But when you decide to quit smoking, your body starts quickly to recover from the effects of nicotine and additives. Blood pressure and heart rate return to healthier levels. Your lung capacity increases and the bronchial tubes relax, making breathing easier. Poisonous carbon monoxide in your blood decreases, allowing the blood to carry more oxygen. 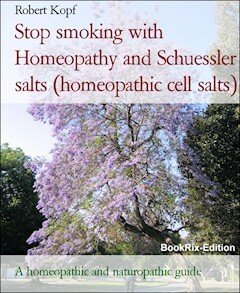 Homeopathy and Schuessler salts reduce the craving for nicotine and may even curb your appetite. In the homeopathic and biochemical treatment (Schuessler salts), detoxification therapies serve the activation of metabolism, the immune system and strengthening the body's circulation. The body will be purified and the dissolved metabolic waste and toxins are excreated through the intestines, urinary tract, lungs and skin. The basal metabolic rate increases and the self-healing power of the body is activated. It states that a patient should be treated with the remedy, which can cause in its original state similar symptoms in healthy people like the existing disease. It notes primarily the main complaints of the patient. Together with a few differentiating additional informations (modalities) then the right remedy will be found for smoking cessation. The dosage depends on the condition of the patient. As the patient improves, the distances between the medication will be gradually extended. In the 19th century the german physician Dr. Wilhelm Heinrich Schuessler (1821 to 1898) developed his health cure with homeopathic mineral salts. In recent years this therapy celebrated a comeback. In his studies Schuessler discovered twelve mineral compounds, comprised each of a base and an acid, which play a crucial role in the function and structure of the body. He developed his own system with which many diseases can be treated in a natural way. In this naturopathic adviser I will give you recommendations how to stop smoking with the help of Homeopathy, Schuessler salts and herbal tinctures. I will present you the most proven homeopathic remedies and Schuessler salts, including the appropriate potency and dosage. Naturopathy works holistically. It does not treat only the withdrawal symptoms. It treats the whole body, spirit and soul. I wish you much success, joy of life and especially your health.